who receives it in a shoebox. Cut fleece to desired size. I like 12" x 15" for an Operation Christmas Child shoebox so it fits easily with all the other gifts, but is still large enough for the child to cuddle. But it can be any size, even made for an adult. This one was 12" x 13" because that is the size of fleece I had. Round corners. You can use a small plate as a pattern or just do it free hand. Make Blanket Stitch around the outside edge. If you need help in how to make a blanket stitch check out this tutorial on how to do a blanket stitch. I made mine approximately 1/2" apart, but again, anything is fine. If they are too far apart when the crochet edging is added it may gap from the blanket. I folded one piece of crochet thread in half with the "fold" at the bottom and the two ends nearest the needle. Instead of a knot for my first stitch I pulled the needle between the "folded" threads and pulled up--this caught the thread without a knot. I left tails on my ends that I tucked under a few of the tops of the blanket stitches near by and then when I crocheted on the blanket stitches they were caught under the stitches. This was very hard to pull the crochet thread thru fabric, I know there are tools to make holes before you do the blanket stitch. If you are going to make many of these you may want to look into getting one of those. Maybe embroidery floss would be easier. Beginning in the center of one side, join yarn color number one to any blanket stitch, chain one and work single crochet around edge. The weight of yarn, your crochet gauge and distance between blanket stitch will make a difference in how many sc fit between each stitch. With my yarn, Simply Soft, I was able to put two in each. You may need to try different hooks and do a little experimenting to get what you like. In each corner add an extra stitch in each of the three corner blanket stitches (the one before the center and the one after center as well as the center stitch). Since I was doing two in each along the side, I did three in the corners. When you arrive at the first stitch, join and finish off. With the second color join in any sc stitch along the side, chain two (counts as first dc), work double crochet in each sc stitch around working two dc in each of the three corner stitches to make it lie flat. Join to beginning dc and finish off. If you would like to add another row just repeat the second row. You could also increase the dc and make it ruffle, but for my Operation Christmas Child shoeboxes I like it take up as little room as possible. You can find more mini blankets at this page: Simply Shoe Boxes Mini Blanket Tutorial of the Month Club. 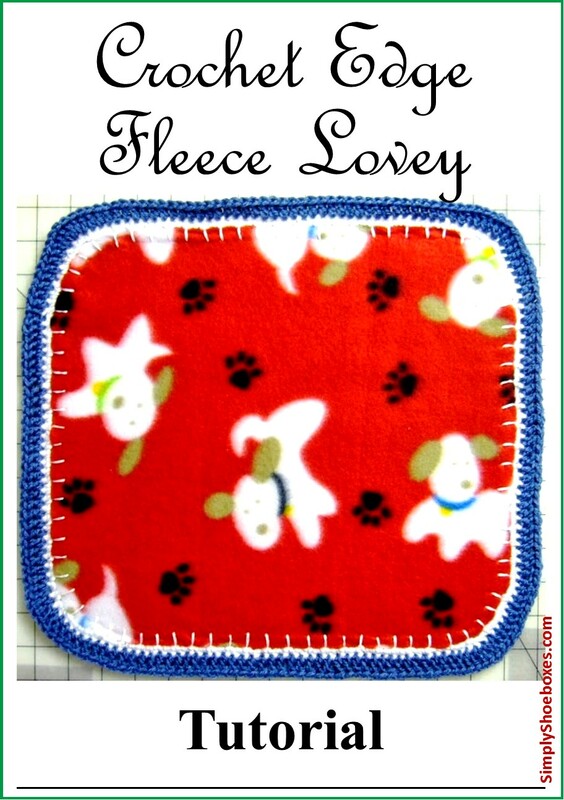 Tip: Purchase fleece blankets on clearance and use for making smaller blanket loveys for shoeboxes. We have several other fleece and crochet crafts as well as dozens of sewing and upcycling craft ideas. Check them all out here: Simply Shoeboxes Craft Tutorials for Operation Christmas Child Shoeboxes. I also have linked this post other blogs. You can check out my list of Craft and Other Blog Linkies to check them out for yourself. Design and instructions copyright Simply Shoeboxes. Please enjoy using this design for your personal use and for gift giving. Your work is beautiful but maybe suggest a simpler solution? Get a skip stitch rotary blade. It pokes holes in the fleece for you, then you crochet, as you have done, into the holes. I use the original with my full size blankets and plain old red heart yarn. Thank you! I'll have to look into it. A friend just pokes a hole with the crochet hook--fast and it works. Eyeball it--you'll be fine. She uses metal hooks, not plastic.